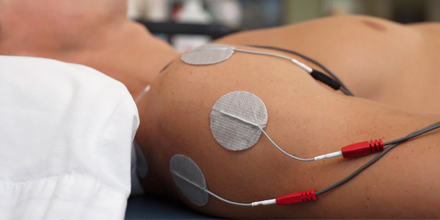 Electrical stimulation is the use of electrical impulses to make the muscles contract or to provide pain relief. 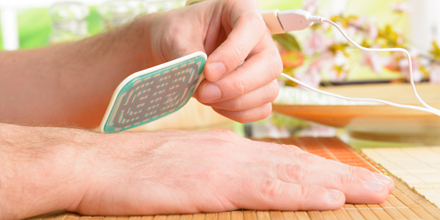 Electrodes (usually small pads with a gentle adhesive on one side) are attached to the surface of the skin and connected to a small device that generates impulses. 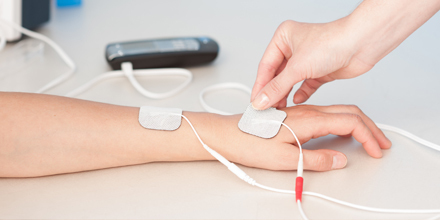 Electrical stimulation might also be referred to as neuromuscular electrical stimulation (NMES), electromyostimulation, EMS, transcutaneous electrical nerve stimulation (TENS), TNS, Interferential current therapy, ICT, or IFC. NEMS is the use of electrical stimuli on a group of muscles with the objective of rehabilitating the injured muscle or stroke-affected area. 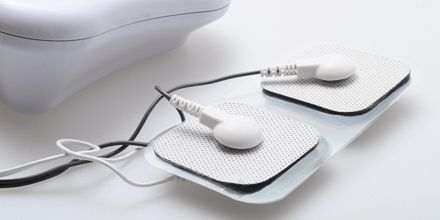 Transcutaneous Electrical Nerve Stimulation (TENS) is an electronic device that produces electrical impulses to stimulate nerves across unbroken skin. It is considered an effective method to relieve pain and inflammation. Interferential current therapy is an effective therapy option used by many physiotherapy clinics to relieve pain and accelerate the self-healing process, getting your body back to a healthy, pain free state.